Theseus is a multinational security services provider. We design customized solutions for government and commercial clients in high-risk, complex, and sensitive environments all over the world. Theseus, Inc. works as a team to promote a culture of integrity, excellence, and dignity in everything we do, making us a trusted global security partner. Established on a solid ground of legal, moral, and ethical values, Theseus, Inc is dedicated to the highest standards of accountability, compliance, and quality. From our founding, we’ve set the standard throughout the industry with our stringent training, and exacting code of ethics. As a paramilitary organization, we pride ourselves on the ability to adapt to any environment and fulfill any task appointed by our clientele. In these times of geo-political uncertainty, our clients seek a reliable partner to help mitigate risk, ensure business continuity and achieve organizational objectives. Governments, multinational corporations and non-governmental organizations rely on Theseus for our robust mission support and integrated security services. From supply chain management to advisory and mentoring. Theseus delivers full-scale, contingency support services. Additionally, our integrated security solutions encompass the spectrum of safeguarding personnel, critical infrastructure and valuable assets. 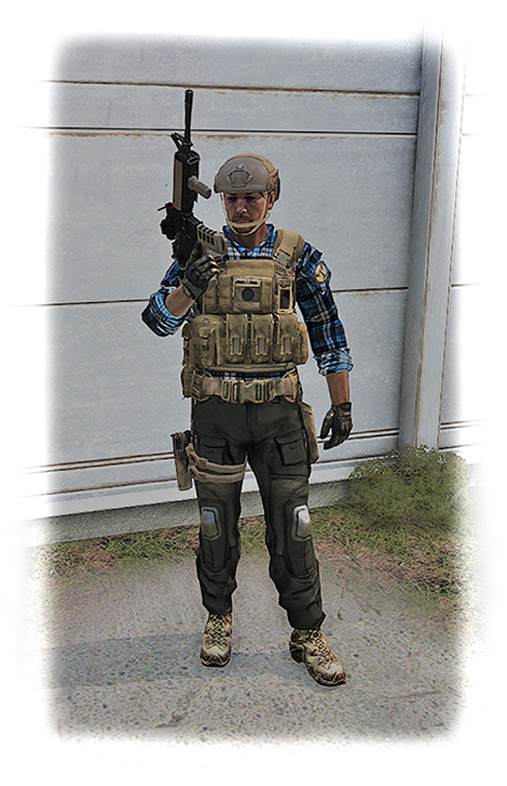 Welcome Arma 3 gamers, this is Mick, a Contractor for Theseus Incorporated. I want to give you a nuts and bolts account of the Theseus play style to help you determine if our contracts and our team are right for you. I also recommend reading the "Welcome to Theseus" description page on our site to get a feel for the role-playing aspect of the unit. Our primary contracts (gaming sessions) are scheduled for Saturdays. There will often be a secondary contract scheduled for a weekday, usually mid-week. Theseus, being primarily European gamers, does schedule its contracts in Zulu (military term for UTC), meaning daylight savings time are ignored. The Saturday contracts typically begin at 14:00 Zulu and the mid-week contracts at 19:00 Zulu. Make sure you check your local times! The contract scenarios are created to accommodate the small unit tactics on which Theseus was established. Expect to see an average of 8-10 dedicated gamers on each contract. Occasionally the numbers will drop to 6 or reach 15 in any given contract, with contracts being adapted to the number of participants. Enemy encounters are based on real world expectations of enemy resistance; some missions are high tension and low contact if we do them right, while others turn a quiet village into the last place you want to be! Occasionally, when circumstances necessitate that the Theseus contracts can't be run, the group will play backup missions created by various members. These have been as varied as a small SOCOM unit on a seek and destroy mission to a group of American farmers fighting off Trump's private army sent to wipe out any resistance to the building of oil fields on family land. Missions aren’t cancelled often, but when they are, we make sure to take out our frustration on the AI! If you want to be involved in the mission making and running, sign right up. We’re always happy to have members involved, whether they’re creating missions, improving our mods, or documenting what we’re up to. During standard contract missions, the usual consequence for death is the end of your game for that session, but we do make exceptions to that rule depending on the mission and circumstances. That said, you don’t want to go down during a mission! While you sit there worrying if your teammates are going to recover your expensive gear, use our improved spectator system to cheer (or jeer) on the squad. That’s right, gear matters! Theseus uses Chronos, an in-house persistence system, to manage player inventories and track gear from mission to mission. Earn money by participating in missions, then spend it on all the gear you could possibly want. Just be warned, you may not get it back if you go down in a mission. Personally, losing my equipment has strongly replaced the fear of dying in game. Respawn is free, but my rifle was not! Thankfully, given a chance, good squad members can and will recover the fallen and return them (and their gear) to base. During missions, we keep the discussions of computer performance and game details to a minimum while in-game. Real world conversations and battlefield humor are typical. Our contractors don't live in a bubble between contracts. Theseus does not use rank titles other than team lead(s) during the contracts. Our Board of Directors do hold special titles within the team for organizational purposes. Team leads give orders sparingly, trusting each team member to do their job. Input from the team members is welcome, though respect for the team lead’s decisions is expected. Along with the in-game experience, the various Theseus Slack channels are filled daily with Theseus and non-Theseus related chat between members as well. Without a doubt, I believe most Arma 3 players will find something interesting in Theseus, and for some of you, this group will be exactly what you have been searching for. The combination of the persistent private military company scenario and the awesome collection of gamers I play with weekly has me looking forward to every Theseus gaming session. I hope to see more of you on future contracts. Take it easy, Mathews out. Here I am just 5 months out of active duty and lookin' for a new gig. This buddy of mine from Afghanistan, Yo Lewieeee!, hope you're good brother! Well he steers me in the direction of private military contracting and this small international PMC: Theseus Inc. They actively recruit for contractors, provide A-class training in small unit tactics, and executive security amongst other services. Did a little research, turns out this PMC has a clean record, no bad press, treat their guys well, pay on time, and offer plenty of advancement. Overall, a group of guys I could be proud to tell my wife's family about. Joining simply required that I send in my letter of interest to the Board of Directors. After giving my application the once over, I was informed that I had the job as a recruit. Theseus got me in contact with the entire team through Slack chat. I received a signing bonus of $3,000 to put towards gear, weapons, ammo to get me started. Theseus has an awesome training facility called Olympus that sits on this sweet island in the middle of the Mediterranean. Bitchin' weather the whole time I was there. The Board has made sure its contractors have all the best tools and training for the job. As a recruit the two contracts I'm part of are a feeling out process for both me and them. Theseus has high expectations for its contractors: teamwork is the foundation for everything and a high ethical standard is essential. As for me, it's a chance to see if I'm a good fit for Theseus and their contracts around the world. No problem for me. I'm no blowhard; I like to scope out how I can best fit in when joining a new team. It was easy work as these guys know their stuff. The future holds lots of opportunities for training and advancement. I just have to bide my time for a couple of contracts, then I will have the chance to work towards additional roles in the Theseus. Theseus has Certificates and Licenses; something like the MOS codes back in the Army, that I can test and train for. Each gives greater responsibility along with greater pay on each contract. Oh, and access to better gear with each cert, license or rank increase! Not sure how much money will be goin' back to the wife. I may have to save a little for myself. I was primarily an autorifleman back in the sandbox. If Theseus has the need for a gunner, I sure would love to be back behind a SAW. Anyways, one contract so far; a hell of a tough fight in Cambodia. Couple of weeks of work earned me some good money, far more than I was lookin' forward to back home. Thanks Lewie, you were right, this IS what I was meant to be doing. Well, off to read the Code of Conduct again, need to be familiar with it! Hey, this is Campbell. The guys here call me Soup. I've been working for Theseus Inc. for a while now, coming up on six months, quick. 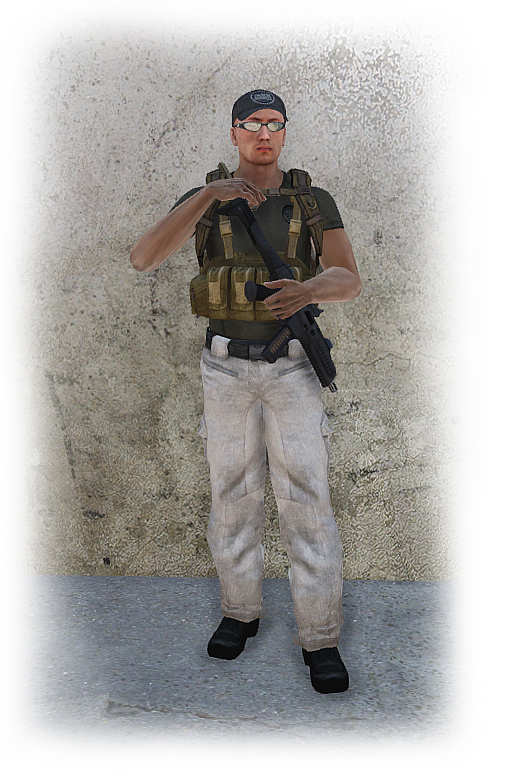 I was recently part of the small team sent to provide personnel and site security for "The Annex" in KalaeNoowi, Lythium. That was quite the harried contract, worked out well for most though. I'm glad to be back at Olympus, working on my Module 2 Contractor training. Downtime exercises have always been a favored part of military service...keeps my mind and body busy. Having recently achieved the classification of Junior Contractor I will be working towards additional certifications. During my initial stint as Recruit, I had completed my initiation training in Module 1. Included as part of this training was my qualifying in the weapons certifications of Basic Rifle and Basic Pistol. I have just purchased a nice used M16 from one of my fellow contractors, similar to the service rifle I had access to in the Canadian Forces. I am now able to carry a sidearm as well. Additionally that first module included a refresher course in Individual First Aid, designed so I can keep myself up and combat effective until the medic can see to my injuries. Fingers crossed that those will be few and far between. Myself and a couple of other junior contractors are headed out after chow to begin training in navigation and map reading. Seems fitting that the course is set at Camp Rogaine. I should excel at this phase as I was a young member of a regional orienteering club before enlisting. The Board of Directors here at Theseus have stated that this is the stage where we may want to start considering what role we desire to fill within the organization. This could be working towards a leadership role, or training for a Medical or Combat Engineer License, implemented upon promotion to Contractor. We may be more suited to a weapons specialist position within the squad, including, at this designation level, the Autorifleman or Marksman roles. I am strongly considering declaring my interest in serving as a Designated Marksman. I scored as Marksman on my PWT 2 and served alongside our rifle company's DM in the Balkans. This position would most match my skills and interests. As part of this, Contractor allows me access to training and testing for the Advanced Rifle Certification. This cert will be critical to moving into the marksman role, as this certification allows me to purchase and utilize larger caliber rifles and more advanced optics, features of most designated marksman rifles. With luck and hard work, the next few months will see me through multiple contracts and challenging training opportunities. Stay safe out there and see you back at the watercooler.